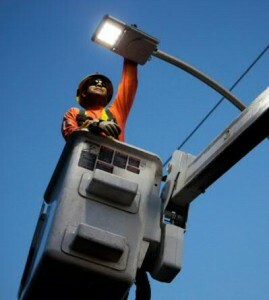 Starting this week, Fort Erie will begin converting streetlights to LED (light-emitting diodes). Approximately 3,266 streetlights are expected to be converted by April 2016. The project was approved by Council as part of the 2015 Budget and will cost approximately $2.3 million. According to other municipalities and streetlight manufacturers, LED streetlights have the potential or actual savings of 30-70% on energy consumption and 75-95% in maintenance costs. Therefore, the town is estimating a potential annual savings of $210,000, which means the conversion could save the Town over $2 million in energy and maintenance costs over the next 10 years. In addition to consuming less energy, LEDs produce a cleaner, whiter light that improves visual acuity and community safety. The beams of LEDs are also more concentrated on the roadway than traditional streetlights, which in turn help reduce light pollution. In order to offset the upfront capital costs of this program, the Town is taking part in the Independent Electricity System Operator and the saveONenergy’s retrofit incentive program delivered by the Canadian Niagara Power Inc (CNP). The retrofit program makes it possible for commercial organizations to install and benefit from newer, more energy efficient solutions. The Town’s contractor, Dundas Power Line Ltd., plans to begin this transition in the Crystal Beach area and progress across the rest of the Town. Standard cobra head lights will be changed town-wide first, followed by the decorative lights. For more information about the project, please contact Robert Judd, Project Manager at 905-871-1600 ext. 2412 or email rjudd@forterie.on.ca.